Ever wondering how a write comes up with his/her first idea to write what eventually might become a bestseller book? Or how do they decide a genre that they want to write about? How much talent one has to have then one can write a book and get it published? How about come to Parramatta Library and join three local writers on a cosy Saturday morning to discuss all those questions and find out what actually inspired them to write their books and got published. Carol Preston is a psychologist in private practice as well as an author. While completing her PhD at Wollongong University, she published numerous academic articles in psychological journals. In 2000, after many years of researching her family history as a hobby, Carol began writing novels based on the lives of her ancestors, going back to the First Fleet of convicts sent to Australia in 1788. Suzannah’s Gold was the first of those stories to be published in 2007, and has just been re- released. Other titles are Mary’s guardians, Charlotte’s Angel, Tangled Secrets, Truly Free, Rebecca’s Dream, The Price of Peace, The Face of Forgiveness. Adrian Deans is a Director, Academic Policy & Quality at College of Law. He’s also a lawyer. In juggling between a busy academic life and writing, Adrian has written Mr cleansheets, Them and the latest one Straight jacket , which is a crime genre with very twisted plots. Adrian studied criminology and forensic psychiatry – and these influences are felt throughout his work . Straight Jacket, in particular, is an unnerving, disturbing, yet humorous and highly compelling novel. Chris Muir is a new comer to the fiction world, a debut novel The savage garden, is what he’s going to talk about. Drawing upon his personal experiences of travelling around Africa, Chris Muir introduces his main character Jack Norton, an ex-Navy Seal who arrived in the continent with noble intentions but has become a jaded mercenary who will fight for the highest price. As Jack navigates rebel militia armies, corrupt governments, corporate profiteers and bounty hunters, he is confronted with the deep social malaise at the heart of the continent. 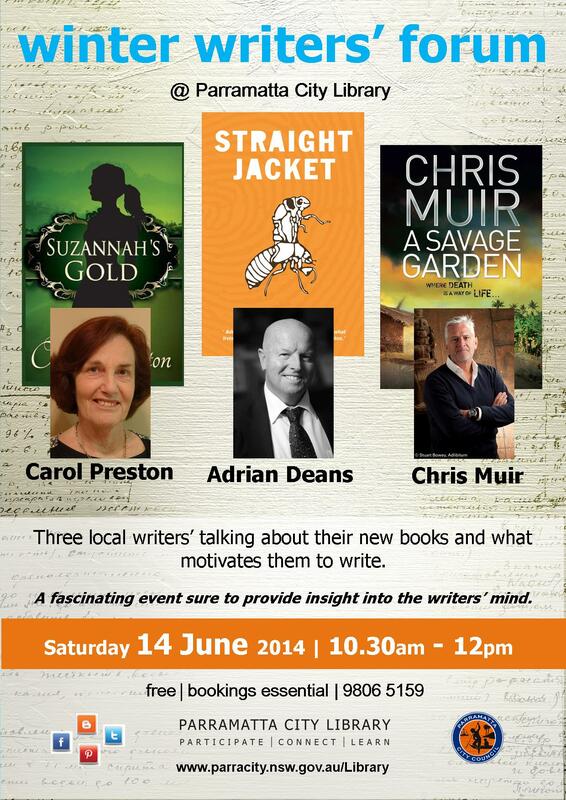 It’ll be a very rewarding morning to see three visiting writers and hear all their stories. Come along and join us. This entry was posted in Australian Authors, Author Visits, Fiction, Historical Fiction, Mystery & Crime and tagged Adrian Deans, Author, Author Talk, books, Carol Preston, Chris Muir, Parramatta City Library, Writer by admin. Bookmark the permalink.